My baby has a what? Once you are 7 weeks pregnant, among other features, your baby has a short tail! Don’t worry, he or she won’t be born with it – it’s just a normal stage in spinal cord development. As early as seven weeks, you baby is starting to develop even the smallest of its features including its eyes, nose, fingers and toes. At only 1/3 of an inch long, it’s hard to believe that all of this is really happening and right inside of you – believe it! How can it be possible to throw up this much? Right around 7 weeks pregnant, many women start to feel sick. 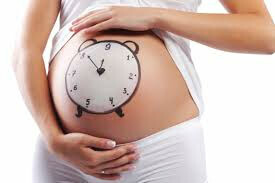 Although it’s called morning sickness, consider yourself lucky if it only happens in the morning. For many moms to be, morning sickness happens throughout the day, any time, anywhere. This can be really frustrating depending on what kind of job you might have, just know that you are not alone. What about being pregnant makes me so sick? It’s your body’s immune system kicking in. Our bodies are really amazing organisms and on first sight, your baby is an intruder and perceived as a potential threat. As your pregnancy progresses and your baby grows, your body finally gets the memo and accepts the fact that this little intruder is here to stay, at least for a few months. Unfortunately, there is no magic remedy to cure morning sickness and it comes down to finding what works for you. For some women, it’s eating, for others it’s not. Follow your gut about what is going to help you feel most comfortable during this difficult time. Additionally, while you are probably getting nutrition advice from everyone and their mother, especially your mother, don’t be too hard on yourself if you’re not able to follow your ideal diet. Sure it’s important to eat well throughout your pregnancy – it’s the only way that you’re baby will get nourishment to grow and that you will keep up your health throughout your pregnancy. However, let’s keep it real. If you are feeling sick all of the time, you want to focus on foods that will stay down and sooth your stomach. With that said, this is also an important time to get plenty of rest. Taking care of yourself and taking care of your baby are one in the same.